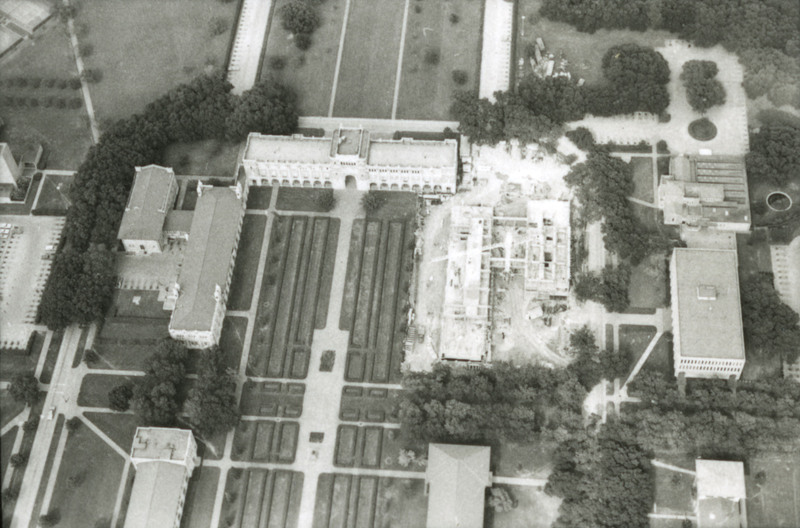 There are a lot of aerial shots in the Campus Photographer collection that are new to me. These shots, although they were often taken for some specific purpose, are jammed full of other interesting bits of information that would otherwise escape capture. Here are a couple from about 1970 that I especially like. They seem to have been taken to record progress on the construction of Sewall Hall, which is somewhat interesting on its own, but the really good stuff is accidental. The first thing I noticed were the hedges behind the Physics Building and then immediately the parking lot back there. I had never seen that before. I suppose at some point after the Bonner Lab was built they tore down the building that was there and replaced it with parking spaces. I obviously don’t know when they disappeared. Even more interesting to me is the parking situation over by Cohen House–many fewer spaces than we have now and an intriguing if tiny porte cochere. You can get a much clearer look at it here. I’ll see if I can find any ground level pictures of what that looked like. 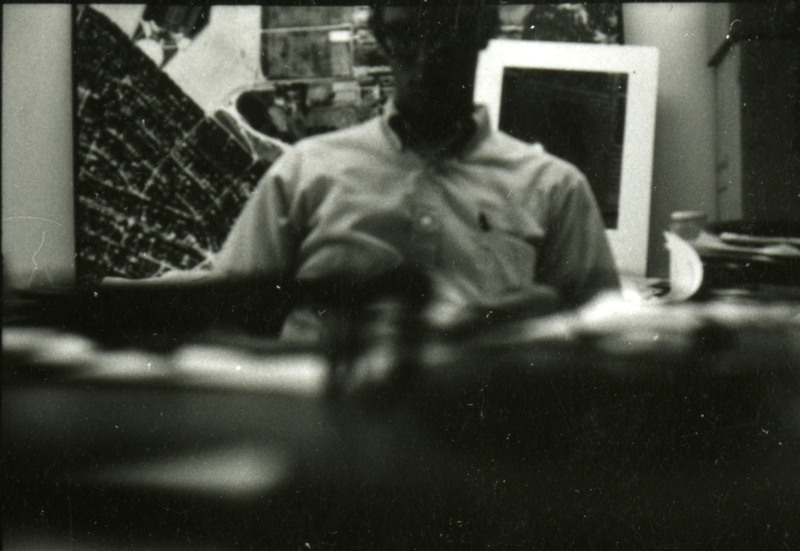 Bonus: These images came off a contact sheet. Here’s the last shot on the roll, notable for what appears to be an aerial photograph on the wall behind the guy’s shoulder. When I got here in the late 80’s there was parking behind Physics. I don’t recall it being a formal lot with lines, though. Maybe it had just degraded over time. I don’t remember when it disappeared exactly, but I’d guess around the time Bonner Lab went away and Duncan Hall arose from its ashes. I’m pretty sure we established in comments on other articles that the Physics lot went away for the Economic Summit. It was certainly there throughout the 80’s. I think we established that the hedges went away then but I didn’t realize there was a parking lot there until today! Maybe I just missed it, which would not be the upset of the year frankly. The parking lot was definitely replaced by grass for the summit. I think that was the only remaining parking lot with Inner Loop/Academic Quad frontage (Bonner’s was enclosed by hedges.). There were a few temporary parallel spaces near Lovett, Allen Center, and the Student Center, and a little bit of temporary parking near Baker College, but I think that was the last actual lot. Herring Hall was there by then, and had been built on the old Wiess lot. Fascinating photographs! 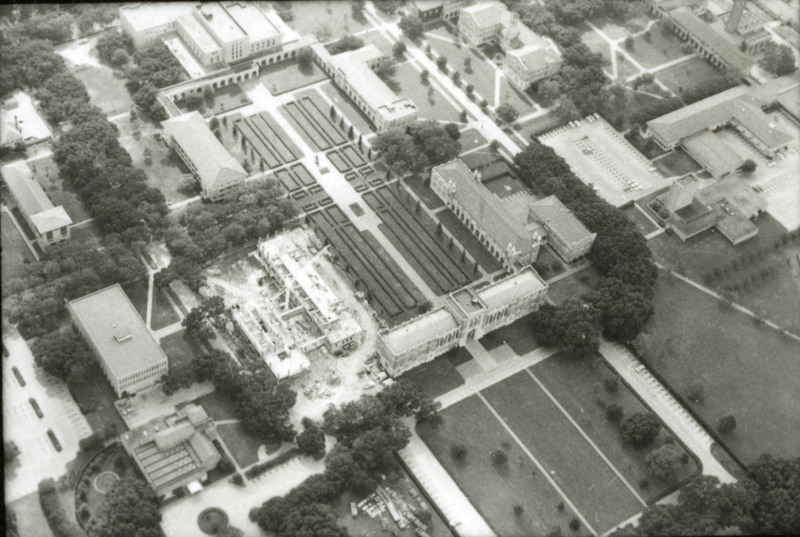 1970 was the year I matriculated at Rice so these aerial views are a window in time to my first year. As an archi, I certainly remember the construction of Sewall Hall. Watching the “mirror image” (generally) of the Physics Building come into focus was intriguing, especially in a time of “modern” architecture. I was impressed by the craftsmanship. Not to mention the idea that it was okay to recreate an historic facade in 1970. That was definitely NOT what we were learning across the quad in Anderson Hall! By the way, I always liked the two sidewalks that crossed the lawn in front of Lovett Hall. When did they go away? The picture was taken before Dec. 31, 1971. The roof beam on the longer section of Sewall was completed by that night and the west end was mostly enclosed. We have talked about the Physics parking lot previously when talking about the research activities of some of the early faculty involving radioactive materials. The lot was removed a few weeks before the economic summit. In 1971, there were at least 3 lots interior to the loop — Physics, Fondren, and Baker/Wiess. The latter two were the same parking lot with a barrier splitting it. The two lots had roughly the same footprint as Herring Hall which replaced it. I was fortunate to have a parking place in the Baker/Wiess lot both my sophomore and junior years (70-72). There may also have been a small parking area to the south of the west end of the RMC. I can’t recall if if was marked as a lot or not. I think I slipped a digit. I think that should be 1970. How about all those cypress trees in the main quad standing straight up? G Lot was the horseshoe-shaped lot on the west end of the RMC, ending on the loading docks of Sammy’s and the Campus Store. I don’t recall a lot south of G, other than the Wiess lot that was replaced by Herring Hall. We haven’t gotten to the filling in of the curved drive that went under the “portico” on the front of the RMC. I keep forgetting how much longer the RMC is now than it was then. Couldn’t use Lot G so it’s not well-defined in my memory. We had SO much fun playing around at night in the Sewall construction (statute of limitations on that is past, right?). Since I graduated in 1971, these pictures show the campus of my memory. Plus, I seem to remember something like the “intriguing if tiny porte cochere” at Cohen House when I left our wedding reception there in 1977. That’s where the “getaway” car was pulled up to take us downtown to the Rice Hotel.